Like with many of Tecre’s button making products, if you want to make a key chain button, you are going to have options. Lots and lots of options. Our goal is to help you conceptualize, visualize, and later rationalize which key chain may be best for you! The Original Key Chain Button. The Key Chain Button was part of Tecre’s original key chain gang. This standard key chain has a flat metal back with a slotted hole. Into this hole, you can snap any of 3 style key chains with an end tab. The key chain button is available in 3 button sizes: 1-1/2”, 1-3/4”, and 2-1/4”. While this type of key chain reigned supreme for many years, the requests eventually came in for a smaller key chain. When customers expressed the need for a “zipper pull,” Tecre responded with a “we gotcha” and introduced not only a zipper pull key chain, but a variety of other attachment options. The Versa-Back button had been born. The Versa-Back Key Chain Button. You may have heard about this revolutionary smaller key chain called the Versa-Back key chain. There is none like it in the industry. The actual name “Versa-Back” refers to the uniquely designed black plastic back that can snap into a specially crafted cavity. It came from a combination of the two words “versatile” and “back.” So versatile in fact that it is available in 3 button sizes. So versatile in fact that it has 5 available key chain accessory options. So versatile in fact that it can be attached to key rings, purses, luggage, jackets, and more! Fun side fact: When Tecre owners and developers beheld their crafty little back they shortly after took name suggestions for it. It was Tecre employee Shawn who coined the name “Versa-Back” which is now widely known across the button industry. In each size, the user loads the shell, mylar, and back into the machine. After removing the button from the machine, the Versa-Back is then snapped into a hole in the back of the button. After the Versa-Back button is completed, the real fun of selecting your key chain begins. You will have an option of 5 different key chain accessories to choose from, each lending a new personality to your Versa-Back key chain. Button Supplies and Accessories for Versa-Back key chain buttons. For more application instruction of the Versa-Back key chain, see here. Now if you are as smart as you seem, you may have noticed that one size is capable of producing the standard metal key chain button OR the Versa-Back key chain button. Yes, folks, if you are the proud owner of the Model 150 Button Maker Machine (or considering purchasing one), you may choose which key chain suits you – by suiting your customers! 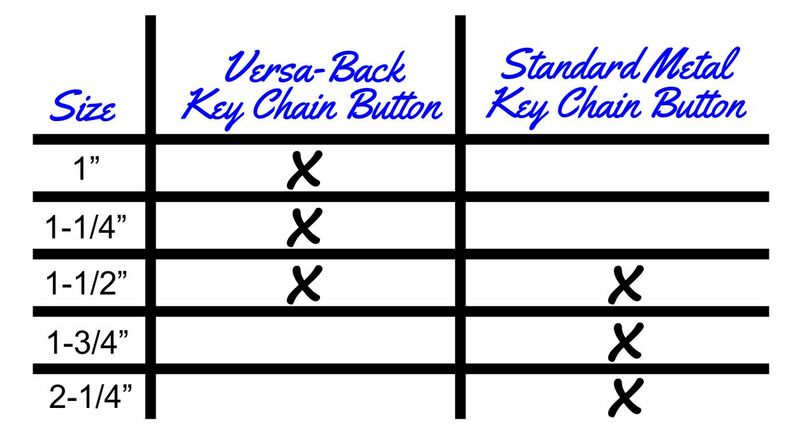 Here is a quick reference chart to demonstrate which key chain complies with your button making size! Key Chain Button Making Options according to size. Of course, as you may have learned, Tecre loves giving you options. And if the above key chain options aren’t feasible for you and your button maker, there is still one more option in the form of Tecre’s Welded Up Eye. What is this small disk and welded loop, you ask? This accessory can be crimped in between a shell and unpinned back. The finished button will have a loop on the back. Tecre also sells an accessory called a “snap hook key chain”. This chain can be attached to the loop, making key chains possible for virtually any button size. Making a Key Chain Button with the Unpinned button supplies and Welded Up Eye. After opting for the best key chain for you, your customer, and of course your button maker, you are ready to make your key chain button! See Brian demonstrate both the making of the key chain button and Versa-Back key chain button below. And as usual, ALWAYS call if you have any questions! This entry was posted in Button Making Accessories, Button Making Supplies, Company News, Manual Button Maker Machine, New Button Making Products and tagged Button maker, button maker machine, button making, Button Making Machine, Button making supplies, Button Supplies, key chain button. Bookmark the permalink.